The PVT L4.5 is the most advanced type of industrial large size vacuum coating system, which includes the newly developed PDA* — technology. It is specifically designed for the deposition of high performance metallurgical coatings, such as AlCrSiN, AlTiSiN, AlCrN, AlTiN, CrN, TiC,N, TiN and many others. Such coatings are evaporated by arc onto a variety of cutting tools, dies and moulds, components and consumer products for wear, erosion and corrosion protection as well as tribological purposes. 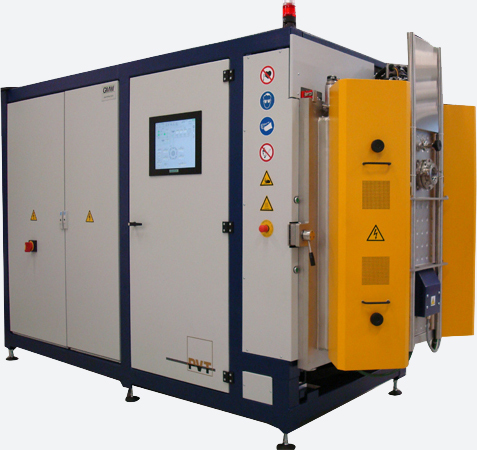 • Robust system designed for the rigorous production environment using sophisticated vacuum coating technologies. • Rugged construction marked by an extremely advanced highly refined design. • Extreme reliability based on intelligent straightforward design and construction. • The broadest spectrum of coatings and coating technology available in a single system at the lowest possible cost.